10ml cobalt frosted blue bottles with roll top. These beautiful roll-ons stand out for their quality and sturdiness. 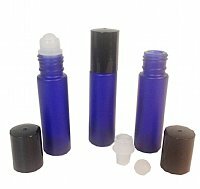 The roller balls and bases can be separated to make it easy to reuse these bottles without removing the base. We've looked at lots of roll-ons and many of them have cheap or faulty roll-on mechanisms. These work beautifully. Perfect for making lip gloss or your own aromatherapy perfumes. These come in frosty blue with black caps. Review: I love these Roll On Bottles. The price is great, compared, what I paid for plain clear ones. The Roll on "Ball" is very smooth, which one of my other once I had purchased somewhere else is not. And of course I love the cobalt blue. I mixed different oils for my migraines and I just love it. I always have a Roll-on mixture with me, where ever I go. 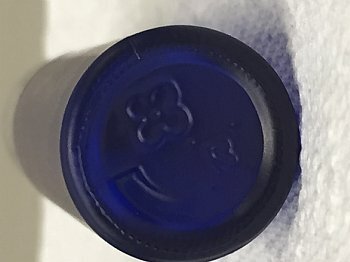 Review: Love these roll-on bottles? Great quality. Review: This roll on bottle works great! It allows one to apply essential oils without using fingers which is especially nice for people who also use contact lenses.